He was born at Chislehurst, Kent, the second son of Robert Bacon (1479–1548) of Drinkstone, Suffolk, by his wife Eleanor (Isabel) Cage. He graduated from Corpus Christi College, Cambridge in 1527, and, after a period in Paris, he entered Gray's Inn, being called to the Bar in 1533. Following the Dissolution of the Monasteries, Henry VIII gave him a grant of the manors of Redgrave, Botesdale and Gislingham in Suffolk, and Gorhambury, Hertfordshire. Gorhambury belonged to St Albans Abbey and lay near the site of the vanished Roman city of Verulamium (modern day St Albans). From 1563 to 1568 he built a new house, Old Gorhambury House (now a ruin), which later became the home of Francis Bacon, his youngest son. In 1545 he became a Member of Parliament, representing Dartmouth. The following year, he was made Attorney of the Court of Wards and Liveries, a prestigious and lucrative post, and by 1552 he had risen to become treasurer of Gray's Inn. As a Protestant, he lost preferment under Queen Mary I of England. 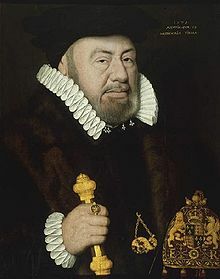 However, on the accession of her younger sister, Elizabeth in 1558 he was appointed Lord Keeper of the Great Seal, largely owing to the influence of his brother-in-law William Cecil. Shortly afterwards, Bacon was knighted. Bacon helped secure the position of Archbishop of Canterbury for his friend Matthew Parker, and in his official capacity presided over the House of Lords when Elizabeth opened her first parliament. Though an implacable enemy of Mary, Queen of Scots, he opposed Cecil's policy of war against France, on financial grounds; but he favoured closer links with foreign Protestants, and was aware of the threat to England from the alliance between France and Scotland. In 1559 he was authorized to exercise the full jurisdiction of Lord Chancellor. In 1564 he fell temporarily into the royal disfavour and was dismissed from court, because Elizabeth suspected he was concerned in the publication of a pamphlet, A Declaration of the Succession of the Crowne Imperial of Ingland, by John Hales, which favoured the claim of Lady Catherine Grey (sister of Lady Jane Grey) to the English throne. Bacon's innocence having been admitted, he was restored to favour, and replied to a writing by Sir Anthony Browne, who had again asserted the rights of the House of Suffolk to which Lady Catherine belonged. He thoroughly distrusted Mary, Queen of Scots; objected to the proposal to marry her to Thomas Howard, 4th Duke of Norfolk; and warned Elizabeth that serious consequences for England would follow her restoration. He seems to have disliked the proposed marriage between the English queen and François, Duke of Anjou, and his distrust of the Roman Catholics and the French was increased by the St Bartholomew's Day massacre. As a loyal English churchman he was ceaselessly interested in ecclesiastical matters, and made suggestions for the better observation of doctrine and discipline in the church. He died at Gorhambury and was buried in Old St Paul's Cathedral, his death calling forth many tributes to his memory. His grave and monument were destroyed in the Great Fire of London in 1666. A modern monument in the crypt lists him as one of the important graves lost. ^ "Bacon, Nicholas (BCN523N)". A Cambridge Alumni Database. University of Cambridge. ^ A.D.K. Hawkyard, 'Bacon, Nicholas (1510-79), of Gray's Inn and York House, London; Redgrave, Suff. Gorhambury, Herts. ', in S.T. Bindoff (ed. ), The History of Parliament: the House of Commons 1509-1558 (from Boydell and Brewer, 1982), History of Parliament Online (accessed June 2018). ^ a b Tittler 2004. ^ a b c d e f Tittler 1976, p. 153. ^ a b Smith 2004. ^ Harley 2005, pp. 4–7; Riordan 2004. ^ Ungerer 1974, p. 278. ^ a b Smith 2002, p. 180. Harley, John (2005). "'My Ladye Nevell' Revealed". Music & Letters. Oxford: Oxford University Press. 86 (1): 1–15. Archived from the original on 23 July 2008. Retrieved 25 March 2013. Smith, Hassell (2002). "Concept and Compromise: Sir Nicholas Bacon and the Building of Stiffkey Hall,". In Harper-Bill, Christopher (ed.). East Anglia’s History; Studies in Honour of Norman Scarfe. Woodbridge, Suffolk: Boydell Press. pp. 159–88. Retrieved 25 March 2013. Tittler, Robert (1976). Nicholas Bacon; The Making of a Tudor Statesman. Athens, Ohio: Ohio University Press. Ungerer, Gustav (1974). A Spaniard in Elizabethan England: The Correspondence of Antonio Perez’s Exile. London: Tamesis Books. p. 278. Retrieved 25 March 2013. Chisholm, Hugh, ed. (1911). "Bacon, Sir Nicholas" . Encyclopædia Britannica (11th ed.). Cambridge University Press. Kimber, Edward (1771). The Baronetage of England: containing a genealogical and historical account of all the English Baronets now existing, with their descents, marriages, and memorable actions both in war and peace. London: G. Woodfall. vol. 1, pp. 2–4.